Before reading any explanation, please watch the video footage below. It is self explanatory. This is the supreme test that any scammer or fake stealth phones vendor will hide from you. are essentially different: a fake and a real one. 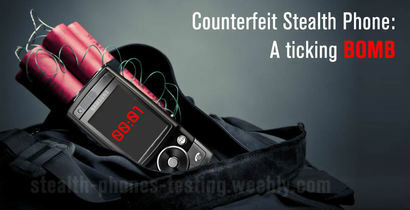 First we have tested the fake stealth phone. Although the SIM card was intercepted, no call interception alarm was triggered. The second time we have tested the intercepted SIM card on a real stealth phone. Interception alarm was triggered as soon as the SIM card has been inserted into the phone. Also during the call was displayed call interception alarm: an open padlock red that persists throughout the call. We are a team of three mobile communications professionals from an European University. Read more about us. Elaborating an academic study about security of mobile communications, our team bought among others a stealth phone via the Internet, as anyone else would do: by choosing the lowest price. We regretted this later, because at that time the low price was only one that made ​​the difference. Current market shows a relative abundance of stealth phones, most of them sold by private individuals on traditional online sales channels (Internet consumer-to-consumer direct sales). A person interested in buying such a phone is no doubt attracted by the lower price, as the only selection criterion, in the absence of significant information about stealth phones and how mobile wiretap works. Many buyers have already made this wrong choice, and now their mobile calls security is seriously affected. Why? Because they bought a cell phone that just looks like a stealth phone without actually having stealth phone functions: only apparently stealth functions are present on the phone, but they do not work properly, as vendors claim. Why this situation? Because a stealth phone needs not only special software, but also substantial hardware changes that make the software run properly. Both software and hardware changes are patented by a Swiss based company, XCell Technologies LLC. This company (and their resellers and distributors) are only able to deliver a true stealth phone, 100% functional. From technical explanations provided by the company representatives we understand that malfunction also come from the wrong choice of phone platform. While legitimate manufacturer use Samsung G608 platform, those fake stealth phones use cheaper Samsung G600 platform, which is simply not compatible 100% with the software (see Photo 1). We have to mention that the two phones Samsung G600 and G608 looks apparently identical, but have significant structural differences. Have you ever wondered why some stealth phones are sold by private individuals? The answer is unequivocal and straightforward: on these phones is installed a cracked software, which not work properly, is unstable and is a fraud, in the end of the day. Also, these phones are not hardware modified in any way, which makes the software installed to be useless, giving only the appearance of a stealth phone, not the functionality of a real stealth phone. In fact, people who sell these fake stealth phones do not know anything about the phone function, nor about the ways in which mobile phones are wiretapped (intercepted). They are limited to installing the cracked software on the phone and copying brief explanations and images from legitimate manufacturer webpage, trying to look more real, informed and professional. Those who buy a fake stealth phone from a private person (as we did in the first instance) will have to face other problems, too: the lack of elementary customer service or worse,completely wrong explanations about stealth phone functions that will seriously affect the security of mobile calls. Also there is no product guarantee or eventual replacement or repair. The fake stealth phone bought by us got stuck after a few weeks of testing and we were lucky that we managed to make the film. Repair or replacement was refused repeatedly by the vendor, and the website where we've bought has not taken any action against him. Vendor says he only sells phones, not repair nor replace them because it's just a private person and he do not provide additional information about the phone, for those who bought it. But when it comes to personal security and mobile communications, such an approach is totally wrong. For these reasons we had to buy another stealth phone, to be able to continue our study on mobile communications security. This way we found XCel Technologies, a legitimate company that manufacture and sells these real stealth phones. Before buying the phone we have asked about operating conditions and repair or replacement in case of failure. We received a prompt and professional customer service, every single time. This company replaces any defective mobile phone, the general warranty term is two years, common to any other mobile phone. Until now, however, was not the case for any fixes, the phone works perfectly and does the job, as you can see in the video. Customer service responses has helped us in our research on mobile communications security, through understanding the ways in which the mobile phone is monitored, tracked and wiretapped, the way it works IMSI catchers (aka StingRays in US) and possibility to detect them. Our study results will be published soon on the University website. Our study conclusions promises to be extremely interesting. For legal protection of hardware changes, on real stealth phones are applied security seals, on the inside of the phone. See Photo 2, below. Real stealth phones have engraved the manufacturer logo (see Photo 3), because they can not be legally sold as original Samsung phones, since hardware and software changes that has been done are beyond the control of Samsung Electronics Co. From this point of view XCell Technologies comply with local law and international copyright law, without any export restriction of their products. Legitimate manufacturer sell stealth phones that are Samsung modded cell phones. Another visible difference: fake stealth phones are using shoddy packaging, a ridiculous copy of the original packaging, as can be seen in the Photo 4. We've got information from other fake stealth phone users that some vendors sell these handsets even in paper envelopes or wrapped in bubble foil without any other packaging. Since a real stealth phone have software and hardware changes, can not be sold as a genuine Samsung phone in the original packaging, because basically is another product. The packaging used by the legitimate manufacturer is a quality one, unique and distinctive. What else a scammer or fake stealth phone vendor will use to make you think that is selling a genuine stealth phone? Well, some of them are trying to use some counterfeit IMEI stickers on the phone backside, trying to give a genuine appearance to their fake stealth phones.Sure, a sticker will not make a fake stealth phone, genuine. In fact not the sticker is important in our opinion, but the phone functions. And fake stealth phone functions does not work at all, as we have clearly demonstrated in the test above. Others will try to lure you with attractive and suspiciously low prices. It's too good to be true? If you find yourself asking this question, then probably yes, it is not true. Others will try to use marketing methods that looks pretty hilarious when it comes to secure phones, as the guy behind imeichanger.com, anti-tap.com and secretgsm.com has done in the past: offering a free t-shirt for every handset that he sold. The same guy has been caught in the past, using fake G608 IMEI stickers, trying to fool people that he is selling proper stealth phones and not fake ones. From then, his business reputation was pretty much ruined and now is trying to promote the idea that the sites and business owner has changed, trying to escape of such a bad reputation.. Please see our blog. The low price can often be a trap, and in this particular case can be a very dangerous one: it will cost your personal security and will disclose secrets that you think you defend by using a fake stealth phone. Trying to help those who want to buy a stealth phone, we asked XCell Technologies to notify us the resellers and distributors list. Company representatives were pretty reserved on the subject, saying that permission to disclose these details is not a part of distribution agreement, emphasizing that some resellers sell these phones under their own trademark and do not wish these details to be made public. As you can guess, private individuals selling fake stealth phones does not fall into this category. For above reasons we have opened an enrollment list for all legitimate distributors of XCell Technologies products, to remove any doubt that might exist because our public disclosures regarding this sensitive subject. This list will help both legitimate distributors and stealth phone buyers.